Heat 4 tbsp olive oil in a non-stick frying pan over a medium heat. Add the onions and fry, stirring regularly, for about 15 minutes, until slightly crisp and golden brown. Remove the onions with a slotted spoon and spread on kitchen paper to drain. Slice the aubergine into 1cm-thick rounds. Mix the cumin and cayenne pepper with the salt, and pepper to taste. 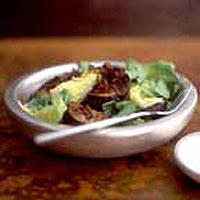 Lay the aubergine in a single layer and sprinkle with half the spice mixture. Turn and sprinkle again. Add 2 tbsp olive oil to the oil still in the frying pan, over a medium heat. Once hot, add a single layer of spiced aubergine. Fry until just golden then flip over. Cook lightly on the other side, before returning to first side and cooking a little longer - about 5 minutes altogether (turning them helps minimise the amount of oil you need). Remove to some kitchen paper. Add 3-4 tbsp olive oil to the pan and repeat until all the aubergine is cooked. Keep warm or cool to room temperature. Separate, wash and dry the lettuce leaves. Put in a bowl with the coriander leaves. Put the yogurt in a bowl with a pinch of salt. Whisk in 75ml cold water. Chill until needed. When ready to serve, mix the leaves and divide between 4 plates. Add the aubergine slices, then sprinkle with the onions. Finally, spoon over the seasoned yogurt. Serve warm or at room temperature as a starter or light main course.